As the producer of Monochroma, for a while after our Kickstarter campaign I have been asked at least 2 times a day how did we succeed. I’m gonna tell how, and also how could it be better. We have been to GDC San Francisco and our booth attracted a lot of visitors. People kept telling us that they would like to support the game if it was on Kickstarter. We hesitated in the beginning because we were an unknown studio from a country which has no reference of game development except a few titles. Our other hesitation was that a platformer is not a genre that have a strong niche. There are millions of platform game players yet for so few of them it’s their favorite game genre. After GDC, lots of big sites covered Monochroma with positive reviews. We have a few talks with Vander Caballero, the creative director of “Papo & Yo” and he told us that the best way to increase awareness about Monochroma was a Kickstarter project. We started to think that we have a chance and it was our only chance maybe so we should give it a try. They want to be part of a unique piece of art/craft. They want that specific project to be created. I categorize Kickstarter campaigns into 3. Projects from Tim Schafer or Brian Fargo fall under this category. They made legendary games in the past and they have a huge fanbase already. The moment their project starts, they are able to collect millions. They have almost no demotivators as everybody is expecting a great game from them. 2. Studios / indie devs with a produced game or developers from an old legendary game. Satellite Reign for example is one of them. The developers are from the old well known title “Syndicate Wars”, or “Battle Worlds: Kronos” which is being developed by King Art Games, they have developed other games in the past, they’re not as ambitious as their Kikstarter title but enough to prove that they are able to deliver a final product. People have little demotivators while backing such projects. We as Nowhere Studios are falling under this category. Luckily in recent years many indie developers have delivered great games so people know that there is a chance for an unknown developer to create a hit but this kind of projects have lots of demotivators as well. Our job is to minimize these fears. For the rest of this article I’m gonna tell you what we have done to minimize these fears and increase the number of our backers during our campaign. We are a studio from Istanbul, Turkey. Turkey is not a country with a game development culture. The only famous game made is “Mount & Blade” by Taleworlds. Turkey’s inner demand for games is high but piracy is higher. From earlier Kickstarter Postmortems I learned the importance of your social network. For people to get rid of the fear that the project gets unfunded you need your social circle and your outer circle (friends of your friends)to back the project especially in the beginning phase of the campaign. In Turkey gamers are usually young males playing fps or moba games online. Not much people are interested with indie games. Whereas all against the turkish reality, we’re making a game targeted to people that is seeking an intellectual satisfaction from games. 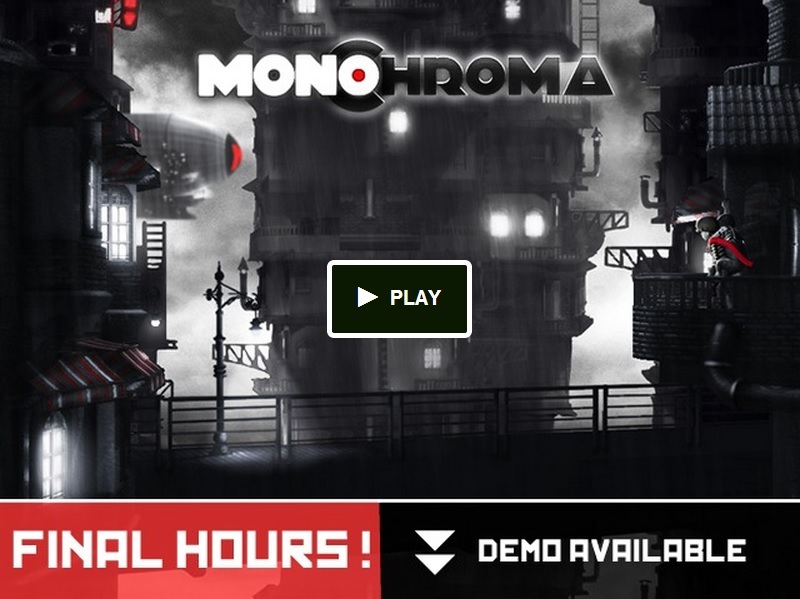 Monochroma is trying to engage people emotionally and intellectually. Therefore we looked for a fanbase elsewhere, but also realized how hard it is to find a fanbase unrelated to your social network. One mistake we have done as an unknown studio was to start our PR campaign along with the Kickstarter process. It should have been started a few weeks ago but we neutralized this mistake by making a 45 days long campaign. We hired a PR agency from US as we didn’t know anybody from game press and expected them to get our game covered by all the big sites. It was another mistake. We also worked with a local PR company in Turkey. I don’t think PR people doesn’t help you on your way but you still have to make the most of the work yourself and many journalist are expecting you to contact them directly as a developer. We couldn’t manage to be covered as much as the time we have been in GDC. So I guess a good strategy would be to combine a nice exhibition with your campaign. One of the best things we have done was to give a demo, it was crucial to tell the backers that we are able to finish the game. Our game is almost ready we just need to make new chapters/puzzles and polish our game a little bit more. It was also important that we started the Kickstarter campaign 6 months before our expected release date after 18 months of development. I believe it’s a big mistake to create a campaign during the concept phase of the production. I know many projects with unsuccessful funding because of that. We’ve also put in some efforts for a professional looking Kickstarter video. Our video has been shown 40,536 times and 16% of it has been completed. The campaign started great as almost all of our friends was waiting for backing it. The first two days we made $8500 with the help of our Facebook posts and their virality. We were expecting it to speed up with the help of coverages on big sites. Except Rock, Paper, Shotgun we didn’t manage to be covered by a big site. We didn’t manage to create the hype we were looking for internationally yet in Turkey we were being covered by almost every game sites/magazines and even on IT, economics and general news sites, we even have been televised a few times. -We created an indiedb account. Indiedb covered its front page with Monochroma for a few days. But no direct traffic came from there on Kickstarter. -We prepared a nice looking website reflecting the atmosphere of the game. I heard about this in earlier postmortems but I never thought we would have the same because we were still counting on the press coverages that didn’t happen. Looking at the Kicktraq graph we really needed to do something. Even our backers were telling us to do something or we are going to fail. We were having nice comments for our demo but people were complaining about the lack of nice reward categories in higher ranks and the scarcity of Kickstarter updates. I have also been told that $30 average pledge was too low. -Opening a Facebook group called “Monochroma to 80000 on Kickstarter”, I was going to share screens, notes and even some trivia about the game for people to feel themselves having exclusive knowledge about the game, I also asked people to invite their friends, the group reached to 850 people in a week. -Starting to make updates and sharing some content in them. Asked the team to create a few concept arts about each chapter and started to tease the story of them in the updates. -Establishing a team of evangelists from our friends. We had around 5-6 friends which were really involved with the project so we called them evangelists during the campaign. We asked them to increase the awareness of the campaign in their social reach, encourage people to support the game, help them opening a Kickstarter account, Amazon payment account. Also we prepared e-mail templates for them to share in the groups they belonged such as school, work or hobby e-mail groups. They were also told to share each Facebook and Twitter post. -Starting to be even more active on Facebook and Twitter and forums, replying to each question and joining in discussions related to Monochroma. -Asking our initial backer to increase their pledge, which helped incredibly again. I made this call around $40000 and I told our backers if they all double up their pledge today, we will be funded. Some of them did and it helped a lot. -Spotting rich guys in my outer social circle (cause I don’t have them in my inner circle) and asking for their help with an exclusive e-mail, phone call etc.. I think this was kind of an extreme thing to do, but it worked and became the turning point of the campaign. -A freeform video contest on Youtube, each contestant with more than 1000 viewers would get a free copy of the game and the first three would be invited to our launch party and receive a collector’s edition of the game. This didn’t have a huge impact but youtube videos are one of the best ways to reach new people. Making a Reddit IAMA that didn’t have a big impact but I had the opportunity of answering a few questions. We had an incredible amount of support from the Turkish game development community and also family and friends. I didn’t think we had such a nice relation with them and sometimes I was afraid that they would see us as their competitors but no, they proved me wrong and enabled this game with their help on Kickstarter. The end of death plateau came after the efforts of calling out wealthy people to support the project. One of them made a pledge of $5000 and a few days later another $5000 came from unknown backer. The second one, from Japan, was not related to any of us or our friends. I believe around 60% of the support came from Turkey and most of them were families, friends and friends of friends somehow. Some would ask if it was worth the effort and I say definitely yes. Because I don’t think a successful Kickstarter campaign is only about the money collected. -A fanbase even before the launch of your game, backers are emotionally connected to your project and they will be your evangelists when your product launches successfully. -An opportunity to receive feedback.